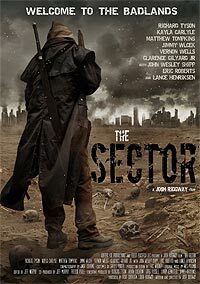 The Sector (2016) - Sci-fi-central.com. USA  2016  86m   Directed by: Josh Ridgway.  Starring: Eric Roberts, John Wesley Shipp, Lance Henriksen, Richard Tyson, Clarence Gilyard Jr., Vernon Wells, Mollie Milligan, James Wlcek, Matthew Tompkins, Carl Bailey, Mark Hanson, Gail Cronauer, Josh Henry.  Music by: Wes Poland. Another post apocalyptic flick where Richard Tyson roams the wastelands as a bounty hunter. During his travels he meets Lance Henrikson who is from an alternate universe and that their universe has been dumping its problems into the other universe or the sector. He finds out he's been dealt a bad hand and sets out to rectify it. This is beyond crap. They should put this film in The Sector. If you're looking for Eric Roberts he does his usual 2 minute scene, near the end. The film is way muddled and just boring. The blood from gunshots is cheesy CGI if that tells you anything. Tyson walks around in this one like he wants someone to shoot him in the head to put him out of his misery. They even set up a sequel. Vernon Wells did a good job playing the baddie which makes it worth at least 3 out of 10.
Review by shawnblackman from the Internet Movie Database.